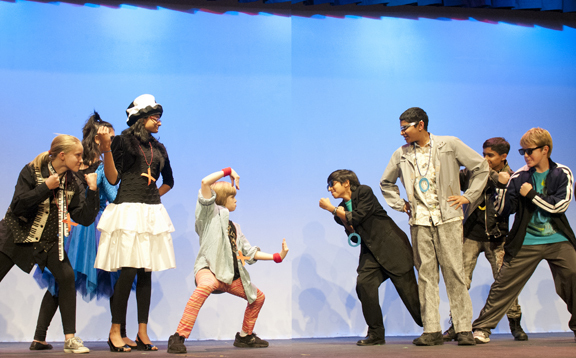 The middle school fall play production, “The Seussification of Romeo and Juliet,” took Shakespeare into whimsical and hilarious territory in late November. Directed by Monica Colletti, the wacky retelling of the Bard’s famous tragedy moved the drama ahead several centuries into the late 1980s with dialogue inspired by another beloved composer of rhymes, Dr. Seuss, alluding to some of the author’s most famous stories, such as “The Sneeches” and “Green Eggs and Ham.” The plotting was mostly familiar territory, with Romeo of the cleverly renamed House Monotone (Aditya Dhar, grade 8) falling head over heels for Juliet of the rival House Capitulate (Zahra Budhwani, also grade 8). With both houses in disarray over the affair (and Juliet arranged to be wed to the unbearably narcissistic Paris), the two lovers concoct a plan involving a fake suicide that, as is now known to many, goes spectacularly awry. Along the way, the feuding of the two houses culminates in a sword fight that ends tragically. This being no ordinary interpretation of Shakespeare, however, much of the material has been lightened up in accordance with the allegorical lessons of Dr. Seuss books. The “poisoned cracker” that Romeo consumes upon seeing apparently (but not actually) dead Juliet was switched for a normal cracker, instead, and the sword fight turned out to not be so deadly after all. In the end, the two families reconcile and, as the saying goes, live happily ever after. But not before performing a sped-up and highly amusing redux of the entire story. Set designer Paul Vallerga and prop designer Carol Clever created an environment worthy of the humorously affectionate play. Clever also designed the cast’s often garish costumes, which were more than appropriately representative of the time period in which the play took place. All the while, the student crew of Sneha Bhetanabhotla and Justin Culpepper, both grade 8, and Praveen Batra and Justin Su, both grade 7, made sure the show was smoothly run and free of technical hiccups.